Seven men have been arrested in connection with the alleged abduction and kidnap of vulnerable Jarawa women on India’s Andaman Islands, according to local news reports. These latest incidents were exposed by members of the Jarawa tribe who reported the eight women missing. It is just the latest in a string of extremely worrying reports of the sexual exploitation of Jarawa women, and the illegal supply of alcohol by poachers invading the Jarawa’s forest. 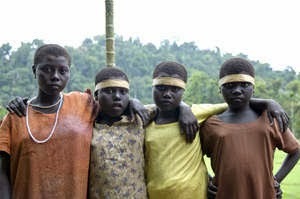 The Jarawa have only had friendly interaction with their neighbors since 1998 and are highly vulnerable to exploitation, diseases, and dependency on goods such as alcohol brought in by outsiders. According to the reports, illegal poachers use the Jarawa women to help with hunting and gathering inside the tribe’s reserve.There are strong indications that the women are being lured by alcohol, and that sexual exploitation occurs on a regular basis. Survival International has called on the Andaman authorities to take firm action against poachers supplying alcohol to the Jarawa, to urgently investigate the reports of sexual exploitation of Jarawa women, and to ensure that those responsible for exploiting and abusing members of the tribe are prosecuted.